Stores in the retail sector must address the needs of their customers while also meeting their bottom line. All aspects of the building construction of retail stores must meet these goals. Many stores turn to polished concrete for their flooring needs because the qualities inherent in concrete polishing are in line with the goals of the store owners. Polished concrete is both beautiful and lustrous, delivering aesthetic value to retail establishments that rely heavily on the attractiveness of their displays in order to sell products to customers. In addition to the beauty of polished concrete, this flooring material also has a reflective quality that provides extra visibility to workers and shoppers. In establishments where visibility and attractiveness is a critical part of the success of the business, polished concrete rises above the alternatives. Concrete flooring is strong enough to handle regular traffic from patrons and employees. In addition, concrete polishing improves concrete’s ability to resist moisture from outside elements like rain and snow. Maintaining polished concrete is relatively simple because its smooth surface wipes down easily and without use of special products. Dirt does not cling to polished concrete, and therefore sweeping it is easy. Most of the time, sweeping and mopping is enough to get it clean. On occasions when wet mopping is necessary, warm water and mild detergent are all that are needed to get the floor clean. This kind of easy maintenance saves retail stores money on cleaning and maintenance. Polished concrete is an affordable flooring material that costs less to install than many other types of flooring materials and which also costs less to maintain. Polished concrete in retail settings rarely needs repair and presents little expense to store owners over time. Polished concrete is an environmentally friendly option that involves no hazardous coatings. Businesses that use sustainable building options often attract customers who wish to provide support to businesses that consider protecting the environment a priority. Retail flooring must possess several qualities, all of which are found in polished concrete: beauty, durability, and functionality. 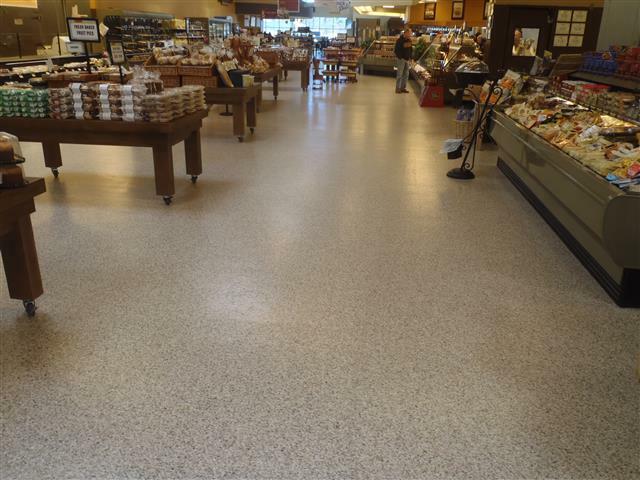 Liquid Floors is proud to provide expert concrete polishing services to retail establishments. For more information about concrete polishing for your retail store, contact us to schedule an appointment and a free consultation.